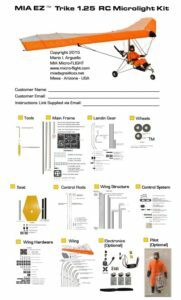 This is a typical Kit Contents checklist we include with every MIA Kit. All MIA Trike RC Microlight kits come with similar contents. They may vary slightly depending on the kit category and size. Be sure to read the short description to see what is included. Bolt-On assembly with a small Phillips screwdriver. Build time depends on user. If you are familiar assembling rc models, this super easy bolt-on kit should take you no more than a couple of evenings, following the clear CAD-Illustrated, Step by Step Instructions, we provide with the kits. The assembly follows this sequence: Frame, LG, Seat, Wing Structure, Wing, Servos, Setup. Should you have any questions, during the assembly and setup, Mario I. Arguello (MIA) the designer is available for technical support via E-Mail. The MIA EZ™ Trike 1.25, is a very sophisticated RC model electric-powered microlight, or powered hang-glider, designed based on modern-day “Strut-Braced” full scale microlight architecture. Therefore, it is assembled, set up and flown, very much like the real thing, but in scale, simpler and also much quicker. This is an awesome! 60″ size model, suitable for flying outdoor, preferably in calm-weather. 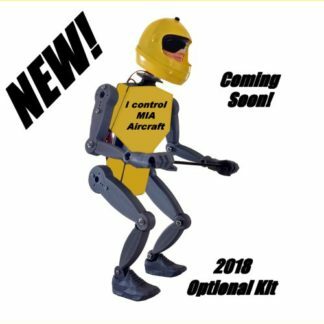 While the model can also be flown in indoor hangers or arenas, it will perform much better in an open un-obstructed area where you can explore the control with ample room to correct any mistake, while learning to fly “weight-shift”. We have flown this model in mild to windy conditions, but we do not recommend this until you are good with the control and have gotten to know the model very well. A great deal of thought has gone into the overall design of MIA RC Microlights, and products, in general. As such these come with unmatched durability, as part of the design. The bolt-on (no gluing whatsoever) main frame, is made from square aluminum, with composite and plastic parts designed, in concert, with MIA Flex™ press-fit connectors and MIA TUFF™ Select light-weight metal and nylon hardware, for ease of assembly and durability. This combination, along with a spring wire landing gear, yields a highly durable and crash-proof frame, which is highly important, especially during the first flights, while getting use to the “weight-shift” control. There is no aluminum on the main parts of the wing structure, but carbon, and nylon, to keep the wing light-weight and crash-proof, on impact. We have also done away with all the poly cables on our earlier designs, and as seen in some of our videos, and have replaced them with carbon rods for easier assembly and set up. 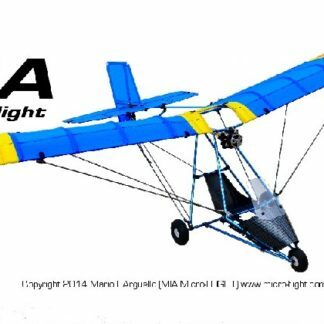 MIA RC Microlights, by nature of design survive, what the typical rc model does not. Be sure to checkout the attached video. We have also included a matching in-scale pilot figure with animatronics head operated via an included servo to provide the model with added realism. The pilot figure is very light-weight and has an internal soft and flexible body which can be installed on the model in the seat and will conform to any position. Typically on an RC Microlight, the pilot hands are attached to the control bar. The pilot figure comes with a color flight suit to match the wing trim color. The pilot head is activated via a spare channel on the customer-supplied RX, or can be mixed with the aileron, via a programmable transmitter, so to provide a left-right movement for realism. Be sure to check out the attached video. In order to fly this model, a programmable 4-6 channel transmitter with elevon mixing and a 2S to 3S 1000-2200 mAh Li-Pol battery and charger is required. This is typically supplied by the user. A great step-up model from our MIA EZ™ Trike 1.0. We highly recommend this model kit, before getting into our “custom” and larger versions, if you are an RC pilot, familiar with traditional RC models, wanting to try something new or explore this exciting area of “weight-shift” RC control. The attached video shows an MIA RC Microlight EZ™ Trike 1.25, which has been “customized”, with a wing done in multi-color stripes, a frame painted in yellow and with strips of yellow heat-shrink tubing added to the struts, to give it the yellow “custom” frame theme. Otherwise, the complete model, power and control is the same as we offer with our standard MIA EZ™ 1.25 Trike RC Microlight Kits.